My friends in Paris think I’m a bit crazy. You see, I’m not only a vegetarian. I’m also a tea-totaller. So what could be more crazy than living in Paris and not drinking wine? So I finally decided to see what the fuss was all about. Jean-Pierre promised a magical experience when drinking wine with cheese. My time in Paris was rapidly coming to an end and I needed a touch of magic. So we planned on visiting the original wine bar, not just in Paris but around the world. It’s a small restaurant in the 11th arrondissement that introduced the concept of expertly chosen wines that are available by the glass and paired with the best foods and cheeses. Unfortunately, it was August and we met outside a closed restaurant. However, all was not lost. Jean-Pierre had lived nearby a decade earlier and knew a special little restaurant. We crossed our fingers that it was still around and not on the standard August Vacation. 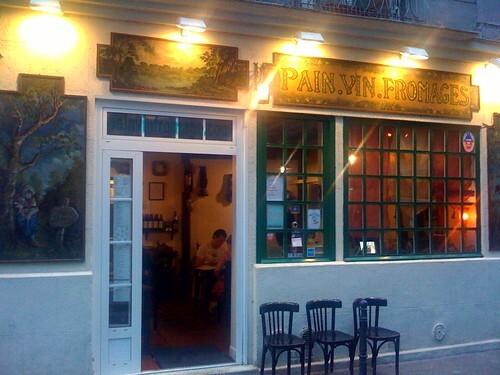 Jean-Pierre lived in an apartment that looked down on this odd corner lot restaurant. He knew it a couple decades ago when the area was buzzing with good ol’ communist and worker activism. This restaurant/bar was a meeting place for the Parisian Proletariat. It’s now more bobo than prolo. The new owners have expanded the space and size of the bar. There’s still a small tribute to its red history, but the conversations are now about food, family, and work instead of revolution. The interior is decidedly “shabby chic”. It’s the antithesis of Bofinger or the new restaurants that are meticulously designed. Le Pure Café seems to have grown organically and still exhibits some growing pains. For instance, the circuit breakers were tripped about every twenty minutes while we were there. The raucous din of conversations would abruptly stop as the lights went out and the waiter would lean over a dining table to flip the switch back on. Le Pure Café has a few vegetarian options on its menu. I chose a baked cheese ravioli dish in a cream sauce. It was very rich, cheesy, and satisfying. However, I was fascinated by my friend Philippe’s dish. He had Burrata. Keep an eye out for this cheese, I think it is going to be the new hotness. Burrata is like buffalo mozzarella with a cream center. He was served a large ball of cheese with a drizzling of pesto and sun-dried tomatoes. He also had a small green salad and some thinly sliced country ham. Obviously you could get it without the ham. Burrata is very soft and tastes extremely fresh. It gives a new and decadent spin to the standard caprese salad. I would highly recommend this dish for your visit to Le Pure Café. I’ve been looking for the cheese in California and have only found it in one Bay Area store. The fromager at Oakville Grocery, in Napa Valley, said the shelf life is very short; so most stores will be reluctant to stock it. One cannot possibly live on pasta alone. No, one needs a balanced diet. In my case, the diet is balanced by a healthy serving of something chocolate. Le Pure Café certainly didn’t leave us unbalanced. Jean-Pierre had a fabu tarte tatin with vanilla ice cream. Philippe had the carpaccio of pineapple (I prefer the version at La Bélière), and I had the mother of all tiramisu platters. I ordered the Declinaison Chocolats, or a quartet of marscapone delights. 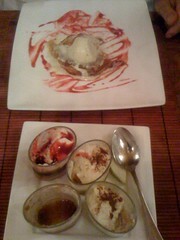 I was presented with four variations on the tiramisu concept. There was the standard espresso/chocolate variety, but I also got Pistache, Caramel, and Fruit Rouge. I truly couldn’t choose a favorite, they were all magnificent. Jean-Pierre and Philippe chose a good, but simple wine for me to try. Keep in mind, I’m over 40 years old and have not drank alcohol. So I was experiencing wine and alcohol at the same time… I have to say, it was horrible! I’m sure the wine was good. I’m sure it would have been magical with cheese. I’m probably going to burn in some alternative wine-hell for dissing vin rouge. But I shuddered and went into body writhing convulsions every time I swallowed the wine. I think Jean-Pierre thought I was being possessed by some kind of voodoo. I now can live the rest of my life knowing that I really didn’t miss anything in France by choosing Perrier over wine at the dinner table. I still enjoy cooking with booze, but I can cancel any future wine trains through the Napa Valley. 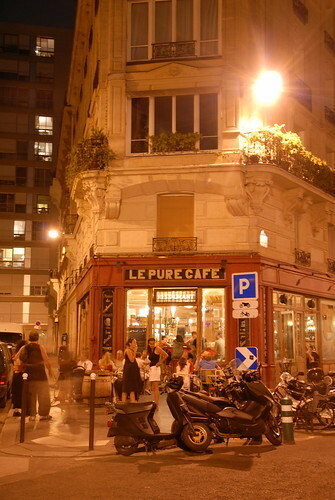 Le Pure Café is a hidden restaurant in the 11th. It sits in the split of two side streets that are accessed via a side street. So you’ll need to have your map with you. However, it is certainly worth the trip. The service was friendly, although a bit slow. The food was wonderful and the wine didn’t kill me. The highlights were certainly the cheese based dishes. I didn’t see much for vegans, but lacto-ovo vegetarians should love it. The restaurant is triangular with large doors on two sides. This makes it fairly wheelchair accessible. Dinner for the three of us, including dessert and wine was 96 euros. Update: Watch closely and you’ll find Le Pure Cafe as the backdrop for a recent Windows 7 commercial on television. Wheelchair Friendly: Easy access via several doors to the seating as well as ample outdoor eating. I don’t know about the restroom.